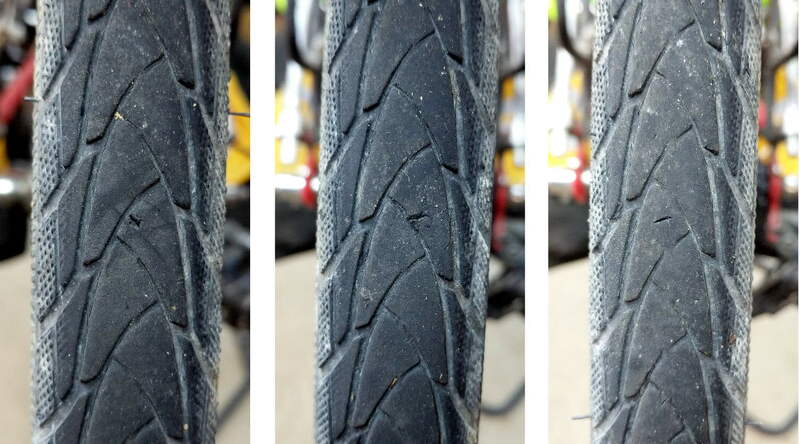 The back tire on my bike was flat when I rolled it out for a ride (the day after replacing the front shifter cable), which ought not be possible with a Michelin Protek Max tube inside. On the other paw, we’ve had zero flats in the not quite two years since installing the things, which says they’re doing very well, and I’ll take a flat in the garage over a flat on the road any day. … from which I extracted two small glass shards. Perhaps a wee puncture spent four days parked at the top of the wheel, with the ProTek’s internal goop drained away and unable to plug the slow leak. Having spun the tire a few times while looking for trouble, I pumped it back up to 80 psi. After delaying the ride for half an hour, the tire pressure remained constant, and we enjoyed a fine ride around the block. Because I’m writing this in the future, I know it’ll hold pressure just fine, which means I can declare victory and move on. The tube & tire weigh more than some frames, but they’re worth it! This entry was posted on 2018-05-18, 07:37 and is filed under Machine Shop, Recumbent Bicycling. You can follow any responses to this entry through RSS 2.0. Both comments and pings are currently closed.